Those who only know Jesse W. Johnson as the frontman of Chicago band Jet W. Lee will see a different side of him on his new EP, "Cannon Rows." 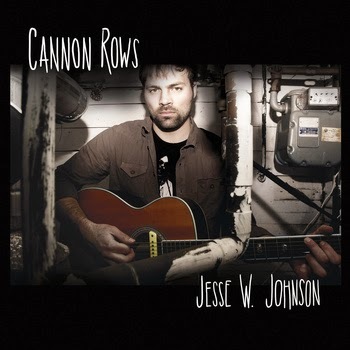 "Cannon Rows" is a quiet album, a stark change from the relentless energy that Jet W. Lee, www.jetwleeband.com, delivers on stage and on record. In support of the new EP, Johnson will perform June 28 at The Throne Room, 2831 N. Broadway St., Chicago. The Holy Alimonies, Swearwords and Doubting Thomas Cruise Control also are part of the bill. The show starts at 9 p.m. and tickets are $7, available at www.thethroneroomchicago.com. I had the chance to talk to Johnson about "Cannon Rows." Q - Your new EP, "Cannon Rows," is a quiet album, much different than the high energy Jet W. Lee delivers on stage and on record. Did you feel you wanted to do something totally different than Jet W. Lee? I didn't really start with the idea to do something totally different, but I certainly had been wanting to do some acoustic recordings and it seemed that the material fit that format well. A lot of Jet W. Lee songs are written on acoustic guitar too but then we give them the rock treatment. I actually started out performing solo acoustic shows and have always loved it. There's definitely a different energy that goes into it than playing with a band, but I love the dynamics and intensity that you can reach with acoustic music. There's no covering anything up, that's for sure. Q - In sitting down to record "Cannon Rows," what were your goals and do you think you accomplished them? I wanted these songs to sound dark and intimate, and to capture as much of the emotional state I was in while writing them. In order to best do this, I wanted to record live and get them down pretty quickly after they were written. I find if I sit on a song for too long before recording, it can lose some of the edge that makes it unique in the first place. It's not an easy thing to get back. Fortunately things went great and I'm proud of how it turned out. I'm OK with a song being a little rough around the edges if it has "that spook" so I ended up using the first or second takes on most of them. Q - Is there a meaning behind the name of the EP? "Cannon Rows" was a title that just came to me when I was in the shower or something, ha ha. I didn't really know what it meant, but when I played that song for my grandmother she told me she pictured soldiers coming home with a bunch of discarded weapons scattered behind them. I like that. These songs have characters at turning points and who are coming to terms with actions that caused other people pain. They've got their own cannons casting shadows behind them. Q - How did the songwriting go for this EP? Was writing the songs for "Cannon Rows" harder or easier than writing songs for Jet W. Lee? Oh man, I don't think the writing was any harder or easier but the arrangements were quicker and the recording was faster. Writing is my favorite part of the process, but the songs were recorded so soon after writing that it melded together. It was natural and fun to do and I wanna keep doing it that way for sure. Q - I understand that Jet W. Lee is taking some time off and will be playing again in July. Do you see this record as a side project? Are you going to be touring with this EP even after Jet W. Lee resumes its touring schedule? I suppose you could call it a side project, but I've always done some solo stuff while Jet W. Lee has been going on too. I love doing both! I'm definitely planning a tour right now for this EP and intend on recording more soon. This solo show coming up June 28th will feature some new songs that I can't wait to do. Q - Speaking of Jet W. Lee, are you guys working on new music? What should people expect from the next Jet W. Lee album? Yes indeed we are. We've actually finished recording our third album and are mixing it now. We hope to get it out by the end of the year. Its gonna be called "Dream is a Dark Cloud," and it features some extremes for the band. There's a few songs that are harder than usual, and some that are kinda country-rock. Overall, its darker than our last album and reflects our experiences hammering things out on the road for the past few years. 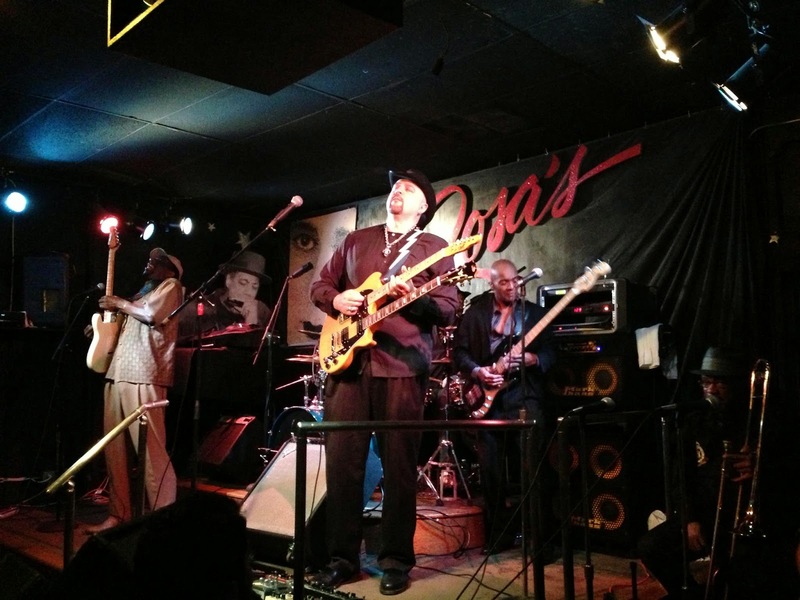 Q - What do you think of the Chicago music scene compared to other music scenes around the country? Are there other Chicago musicians out there that you admire what they are doing? Chicago has a ton of awesome bands. A few of my personal favorites are The Safes, The Runnies, The Noise FM, Panoramic & True, Birches, and The Thons. They are all above else fantastic live players, which means the world. Plus, I admire their work ethic and songwriting. I love that Chicago has so many bands, but sometimes it feels like too many going in too many different directions. I think we could benefit from more unifying events like the Lottery League they have in Cleveland, where local musicians are randomly assigned into a band and given time to write, record, and play a few songs at a showcase. It's a fantastic mixer that promotes the scene as a whole. My favorite venue here is Coles, because they book great bands, they don't charge cover, they run good sound, and they pay bands fairly. Who would've thought?! I'd love to make a sad, dark song with Jessica Lea Mayfield. She's one of my favorites right now. Plus I'd love to be a part of something with David Bazan. What a great voice he's got, not to mention his songs. 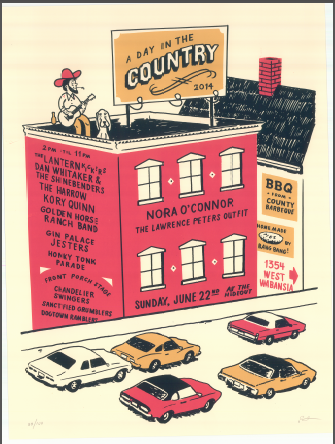 The summer music festival season will kick off on the right note with the seventh annual "A Day in the Country," which will be held June 22 at The Hideout, 1354 W. Wabansia Ave., Chicago. Q - Good talking to you. How did you go about putting together this year's lineup? Are they all bands that you personally know or have played with? Likewise. Yeah, the bands are mostly made up of friends and fellow travelers, and I’ve played shows or been in bands with most of them. I’ll occasionally bring in a favorite group from out of town like Red Meat, who came from San Francisco to play last year’s festival. Otherwise, it’s all about Chicago’s pool of talented mofos, with this year’s highpoint being Nora O’Connor playing a country set. Q - What made you want to start "A Day in the Country" in the first place? How has the festival grown over the years? It started when I learned that The [Lawrence Peters] Outfit hadn’t gotten into a big Chicago festival, and neither had any of my friends. My band got to play [a big festival] a couple years later, but at the time it seemed like another nail in the coffin of a the kind of country music I like. My response was to start my own fest, and book it with what I thought were the best examples of the good stuff. It’s been gratifying to see the fest becoming a yearly tradition. I have friends bringing their babies to it, as their first music experience. That is more valuable than I can describe. Q - You've been performing music for more than 20 years. How did you get involved with American country music in the first place? Would you classify yourself as an alternative country musician as opposed to mainstream country, which seems to be a lot of pop music which tries to pass itself off as country music? I’ve been listening to country music for as long as I can remember. I grew up on country radio, in the '70s, when older classics and new hits were played side by side, so I got to got to hear what tradition and innovation can sound like when the latter honors the former. I got the hell out, when things got dire in the late '70s and early '80s, but Dwight Yoakam and The Knitters brought me back in. I consider myself to be a country musician. I don’t like much mainstream country (though there are exceptions), and I don’t think of what I do as alternative, in the sense of what the term has come to mean, as its own genre. In my opinion, what I do should be called country, and what’s on the radio should be called something else, like “Nashville Pop” or “Processed, Artificially Flavored *Country Product.” *Contains no actual country. Q - Tell me about your involvement in CHIRP Radio. What have you tried to do through being a volunteer for CHIRP Radio? I’ve been volunteering there since just before the station went live on the net. I had a regular show for the first six months, but gave that up when my tour and gig schedule got too tight for a weekly spot. I still sub when I can, and I call my show “The Mutant Hit Parade." I spin my version of “the hits,” meaning songs that I think are catchy and unique, but maybe a little weird, and mostly unheard of. I also contribute reviews to the CHIRP music library. Q - Your band, The Lawrence Peters Outfit, released its debut album nationally in 2012. Are you working on new songs with the band? What were your goals in forming the band and do you think you've reached them? I’ve played with lots of great folks over the years and have had some rad times, but I wanted to give myself a chance to see if my ideas were good enough to stand on their own. I wanted to write more, and I knew that wasn’t possible without being the leader of my own band, where I’d have control over the sound and influences. I’m very happy with my band. It’s always a great time, and the music sounds just the way I like it. The last couple of years have been all about getting the most out of that first release, and that’s finally paying off. We’re getting better shows and opportunities, with less effort on my part. Now that I have some solid momentum from that, I’m making some space to finish the pile of partial songs I have in my book. We’ve been doing one that I just completed, and it’s sounding great; very encouraging for the next stretch of writing, and the new turf I want to cover. Plenty of stuff in that category - I’ve got a secret list of folks that I want to have add their magic to the next record (the last one included Robbie Fulks, Kelly Hogan, Nora O’Connor and others). I’m looking to get The Lawrence Peters Outfit into more out-of-town festivals, and some European touring. I’m working on a country music podcast that will spotlight a lot of classic and lesser-known performers, plus some other choice content. Among the highest on my list of tough nuts to crack is getting to play the Grand Ole Opry. Improbable, but I always need a sore tooth to worry. Cincinnati-based Buffalo Killers continues to expand its sound, as it demonstrates on its latest album, "Heavy Reverie." 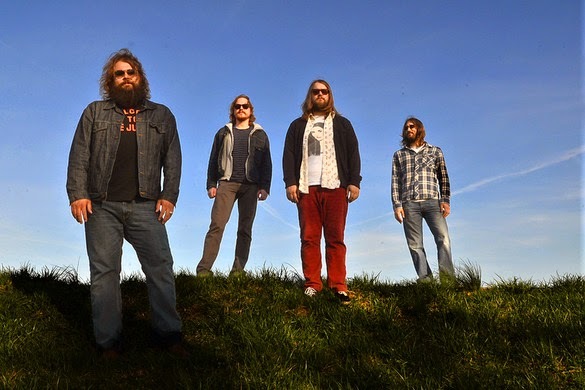 The band, comprised of brothers Andy and Zachary Gabbard and drummer Joseph Sebaali, also recently added a fourth member, Sven Kahns on guitar and lap steel, which has helped Buffalo Killers develop a fuller sound. That sound will be on full display when Buffalo Killers performs June 28 at Double Door, 1572 N. Milwaukee Ave., Chicago. Killer Moon, Aktar Aktar and Thee Arthur Lane also are on the bill. I had the chance to talk to guitarist and singer Andy Gabbard about the new album. Q - Great talking to you. Your latest album, "Heavy Reverie," was recently released. In sitting down to make the album, what were your goals and do you think you accomplished them? We don't really sit down and set goals for our band. We just like to create songs and play live. My brother and I both write a lot on our own so when it's time to make an album, we just bring our songs together and work it out as a band. As time goes on, we all have become more concerned with supporting the songs rather than showcasing ourselves through the songs. We just wanna write good songs. No gimmicks. Q - The album was produced by Jim Wirt, who has worked with a variety of bands over the years, including Incubus and Fiona Apple. How did you hook up with him and what do you think he brought to the table? His label, Sun Pedal Recordings, contacted us and they would come and see us play whenever we were in Cleveland and take us to Crush Tone. After a while, we made plans to record with Jim. When we came up we played him the songs and he was into all of the arrangements, so we went ahead and knocked out all the music. We spent most of the four or five days we were there getting the vocals real good. Jim is a great vocal coach, we've never had someone like that before so it was a new experience. We like to do new things. Q - It only took five days to record the album. Was that because the process went so smoothly? What was it like tracking the album on the Neve console that Michael Jackson used to record his "Thriller" demos? We were well rehearsed for the session. We had all the songs down pretty tight as a band so it did go smoothly. Although I don't think we had all of the lyrics written and whatnot. Recording on MJ's Neve was awesome. We are now linked in some way, ha ha. Q - You recently added a fourth member to the band, Sven Kahns. How has that helped the band? Was it just the right time to add another member? We are louder and fuller now. We sound better live. And we can record faster in the studio cause I don't have to add any rhythm. Also, Sven is an amazing pedal steel player. Which can come in serious handy! It 'twas the right time. The right bro. Q - What are the benefits of being in a band with your brother? Are there any negatives? Our voices blend well. We are always on the same page musically on another brotherly level. We get to spend time together. We grew up together! Being in a band with your bro is awesome! We never fight! No one believes us! Q - Buffalo Killers was formed after your previous band, Thee Shams, dissolved. Did that band just run its course? What your goals in forming Buffalo Killers? Thee Shams had its own thing. Its own sound. You need certain people to achieve that sound. And us three had our own sound. We were all in Thee Shams at one time. But the three of us alone were obviously a different band. It was all new when we started Buffalo Killers. Q - What was it like opening for The Black Crowes? Did you see that as a turning point for the band? It was a lot of fun. A great learning experience. When we first went out with them, we had just formed basically. So looking back at it, I think it was great for us to be pushed out in front of so many people. At the time it was terrifying, ha ha. We are very fortunate to have had the opportunity to open for such a legendary band. Q - After the band finishes its current tour, what's next for the Buffalo Killers this year? We have another album in the can we are hoping to release on Black Friday. Besides that we will continue to do our thing and promote "Heavy Reverie." Thanks man!